The original American-made vintage vans owe a debt of engineering gratitude to their German counterparts. 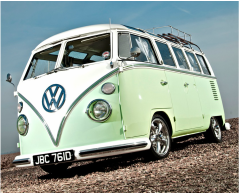 It was Volkswagen who made the first foray towards the consumer market in 1950 with the venerated VW vans, commonly referred to as buses back in the day. 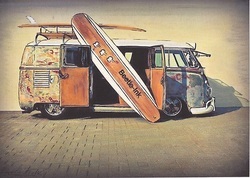 Surfers can also take credit as they scooped up older VW buses in droves and re-purposed them for personal surfing shuttles. VW buses have gone on to become highly prized among enthusiasts, with restored rare models eclipsing six figures. 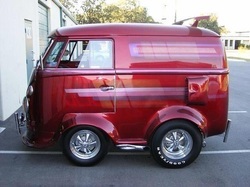 In the early sixties, Chevrolet also took a run at the air-cooled concept with their Corvair van platform. Originally considered state-of-the-art, the Corvair's handling characteristics were subsequently called into question by infamous buzz-killer, Ralph Nader. 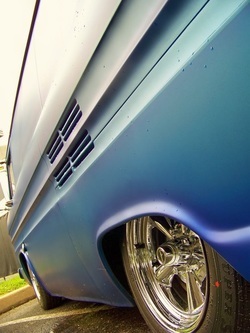 Although beautiful examples exist to this day, any many have logged hunderds of thousands of trouble-free miles, perception conspired to seal the Corvair van's fate. The "mid-engine" vans that followed proved to be outstanding light and in duty vehicles. Air-cooled configurations featured rear "pancake-style" engines, which afforded the interiors more space, and in particular the option of bench seating up front. Opting for front bucket seats allowed an open pass-through area, thanks to the engine and transaxle being at the rear of air-cooled vans. 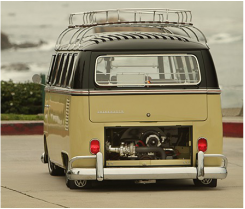 As far as mods go, VW buses were occasionally sectioned and chopped, but most owners stuck to simpler modifications such as engine upgrades and aftermarket wheels. There is a growing legion of VW van lovers who are preserving the evidence of their vans' prior commercial lives and modifying their drive trains and suspensions while keeping the original paint largely intact. A certain amount of roachy patina and light rusted rust are actually sought after by a growing throng of VW fanatics, a phenomenon which is beginning to translate over to the early domestic vans.